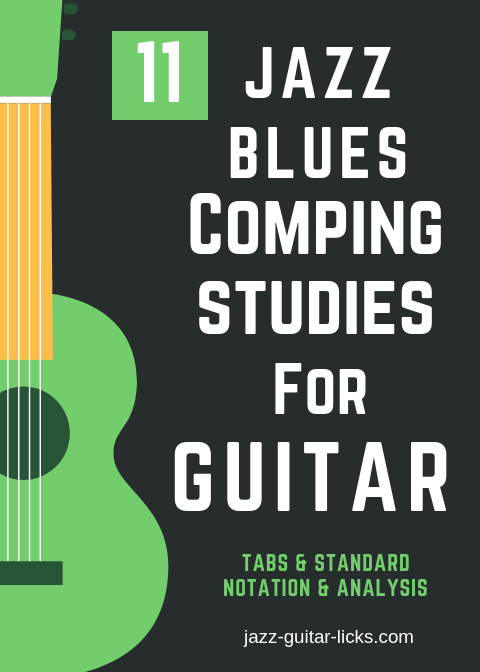 This first chapter is about six progressively difficult blues progressions. The purpose being to hear, play and understand the main blues progressions found in jazz by using three-note and four-note chords (drop 2 and drop 3 voicings). The aim of this chapter is to make evolve the same blues-jazz progression using different chord voicings. (rootless, drop 2, drop 3, extended and inverted) through 3 studies. This chapter is focused on a really cool comping technique which consists in linking chords together by using bass notes as a bass player would do. Two blues-jazz progressions are developed in it. 18 rhythm patterns to be used on the previous studies. 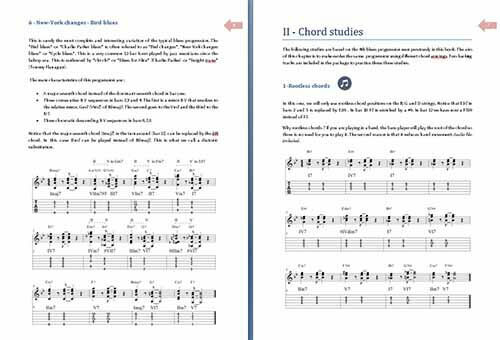 1 printable PDF eBook with 11 blues, jazz progressions with tabs, standard notation and analysis. 2 blues, jazz backing tracks (bass & drums). 120 & 160 BPM.